Utilizing the Biohorizons Titanium and Ceraroot Zirconium Oxide anchors we are able to replace missing teeth. Whether you are missing one, several or all your teeth dental implants can be used to anchor a beautiful long-lasting solution. 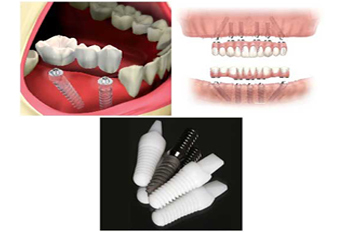 Dental implants are a proven way to replace missing teeth and rehabilitate a severely handicapped jaw. Sometimes we utilize bone and gum augmentation to make sure that the foundation that the dental implant is set into is stable. The DH Smile Center is also one of the few clinics in North America using non-metal Zirconia Ceraroot implants in replacing missing teeth.